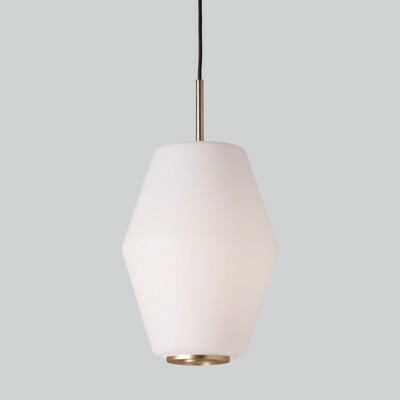 The Opal Lamella pendant designed in 1959 by Svend Aage Holm-Sørensen is produced by Warm Nordic as part of their classic collection. Produced from opal glass which creates a warm glow. The glass centre of the lamp is then surrounded by the sculptural metal outer which can be selected in various different silk matt colours, all mounted on a brass suspension. The lamp emits indirect ambient light and can be used singularly in a bedroom or used in rows over the kitchen island or dining table.